Actually, the drill for Sandy Hook event was set for Dec. 13. The manual is now available (leaked). This is why Adam's death date was Dec. 13. The birth notice below is likely concocted and all pictures of "Adam" are of the brother. The house was empty by every indication. Nancy was Annie Haddad, a teacher at another school (St. Rose of Lima), where also the principal for "Sandy Hook", an empty school itself, was also working. Those two are probably paid off like the rest of the participants, but in their cases in witness protection (unless, by making plans with crooked intel, they have been killed). https://www.reddit.com/r/conspiracy/comments/2hpat6/nancy_lanzaanne_haddad_is_becoming_one_of_the is a good short page on the Annie Haddad aspect of this problem. On April 12, 2013, I commented below in some updates, still assuming Adam was real, but at least the comments directly below give some idea of the sources for the planted newspaper article this post was originally about, and show my thought process at the time. So I am leaving them. 1. This page is a favourite with many around the world. 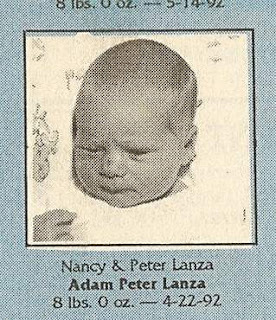 But first, For persons doubting if the Lanzas exist, let me make a point: Lanza family is not likely to be entirely fake, per this obviously very likely real newspaper announcement below -- i.e., this post itself, about Adam's own birth, as you'll see http://www.seacoastonline.com/articles/20121216-NEWS-121219808 (and the following: http://books.google.com.pa/books?id=7VQbqh3gIVYC&q=lanza#v=snippet&q=lanza&f=false ). True, a whole family can be made up, but too many are rushing to that conclusion without considering the opposite possibility. Note that SSDI records are done Locally only, so when Adam died, whoever submitted his record would be local and likely truly did submit a Dec. 13 date accurately, for whatever reason he died or was murdered. --------- However, if Adam Lanza himself IS a totally fake person, and so is this buried story you'll see below (from Dec. 16, talking to a supposedly distraught New Hampshire archivist and nurse), then fine. Sandy Hook story is so filled with unknowns, let's not be dogmatic. But one way or another, few realized there was any sure connection between Lanza and any early life. Well, looky here. The name Adam Lanza does exist somewhere before Dec. 14. If this image was not created from someone else's newspaper article (faked -- and it doesn't look fake) then Adam was not from Connecticut, but from New Hampshire originally.. The purpose of this post was to show that from this image and the article about it, the SSDI listing of death on Dec 13 in New Hampshire and the "P" in the SSDI listing were indeed linked to our story. The Dec 13 date for this fellow is now changed to Dec 14. Adam is the same guy as the SSDI Dec. 13 record, as shown on SSDI screen shot (Intelhub) and in Genealogy Bank and Ancestry.com (per live screenshot videos on Youtube). The P in the SSDI record and the location (New Hampshire, not Connecticut) for the source, confirm that the SSDI listing of Dec 13 (Edit: now changed to Dec 14 after this post went up) is the same Adam. 2. Now we CAN FINALLY know that it's the same Adam Lanza: he's dead on Dec. 14 in Connecticut (according to the shooting), and dead on Dec. 13 in New Hampshire (according to the SSDI). How do we know he's the same? SSDI -- Social Security Death Index -- with an Adam P Lanza dead in New Hampshire on Dec 13, and Sandy Hook's Adam P Lanza MATCH birthdates and state. Now we CAN FINALLY know that it's the same Adam Lanza: he's dead on Dec. 14 in Connecticut (according to the shooting), and dead on Dec. 13 in New Hampshire (according to the SSDI). How do we know he's the same? Adam P Lanzas birth notice in the Exeter News-Letter, New Hampshire, on June 16th, 1992, same as the Adam P Lanza recently noted as deceased in the SSDI (Social Security Death Index) on December 13th in New Hampshire must be the Adam Lanza responsible for the Newtown shootings. Adams mother and father met and married in New Hampshire. The funeral, a private one, was held for 25 family members in New Hampshire. He wasn't mentioned in his mothers obituary. He had no obituary of his own. The date of the 13th is a clerical error or on the conspiracy theory side. Either way, it's the same Adam Lanza. [Believe it or not, though he says sometimes I'm disinfo spreading or even an agent myself, this find was provided by Sandy Hook debunker, but conspiracy 9/11 theorist, Jeff Prager. It is actually typical of sophistic techniques -- in this case, applied by Jeff Prager -- to take remote possibilities and then promote them to probabilities and eventually treat them as certainties. Most persons who do this, do so willfully but not consciously; they slip into it because they want so much for a result to be so. Jeff has thought that collecting possibilities and discussing them is sophistic (my work here), but I am not trying to stretch things beyond a reasonable false flag storyline ... whereas he's taking things out of context and then stretching them. He is not an agent, a disinfo type, as he accuses me of being sometimes, but he is willful. More about the reasoning follows the two screen shots. But it's technically possible. I think a jury of regular, non-prejudiced persons on either side would agree with the unreasonableness of the Jeff Prager position, but it's not UNREASONED; it's technically possible. So now, if we do NOT have a clerical error and it's the same Adam ... Satanic cults protected by paramilitary took him out (man behind Soto is a possible indication of the presence of such types and Adam's friend saying he was really into Satanism)? Military assassination took him out? Was sick before? What? I am not ruling out some Mossad or other involvement, including Vatican ... a man dressed as a priest was reported as entering and being the shooter; nun or priest costume in the van from Duff's sources ... are possibly each true and need consideration in the "maybe pile." As to Jeff, he really wants a probably dead-too-early Adam -- whom he accused me of not understanding was likely not the same guy -- to have committed this crime. Okay, so maybe he did; but I think not. Jeff doesn't realize that predictions from a theory are part of how we know it is correct -- at least MUCH of the time, but not always. We could have the wrong theory and happen to be right it's the same Adam, sure, but his accusation of me as being crazy to have even supposed it MIGHT be the same Adam, and then to put me down ANYWAY when he finds out it IS the same Adam is patently unfair. Even so, let's admit we don't have direct proof exactly that it IS the same Adam, if he wants to be technical about it!!!!!!!!!!!!! Same birth date and state and middle initial, but it's not stated who the deceased's parents are! How about that, for being technical. But on that, he's willing to cut the cake. Not on conspiracy, but that Adam "must" be the same. Well, Jeff, technically NOT. In his note to me he even said Adam must be the same and then, hypocritically, added "Duh"! As if that had been his position before. I have put up his theory on my post, and have also mentioned clerical error. I have also mentioned the fact Adam may well have died before the crime.